There is a brief moment, after I shuffle through the flapping gates, slide down a short path and when I am waiting for the chairlift, that I am tempted to abandon the whole thing. There's a quick flash of panic. A rapid recollection of everything that could possibly go wrong and the list is long that I briefly consider turning around. But there's no way out unless the operator presses the red button and I take my skis off and wade in the opposite direction through the crowds of waiting (and by now annoyed) skiers. But the jolt from the chairlift that knocks me behind my knees, is enough to snap me out of my reverie and I collapse into it gratefully. There are some to whom the idea of deliberately launching themselves from the side of a mountain is pleasurable. I am not one of those. Skiing to me is very much an acquired pleasure. And this was my very first ski break. Madonna di Campiglio was a natural choice as we'd been there over summer and spent hours wandering the beautiful mountainside that surrounds the town. The Director of the hotel told us that there were plenty of ski runs around the hotel and we need not bother getting into a vehicle to get there. That sounded immediately appealing to me. If there is one thing about skiing that I find bothersome it is the endless preparation you need to do before you can hurtle down a slope. For most other sport, it's a quick change and you're there. 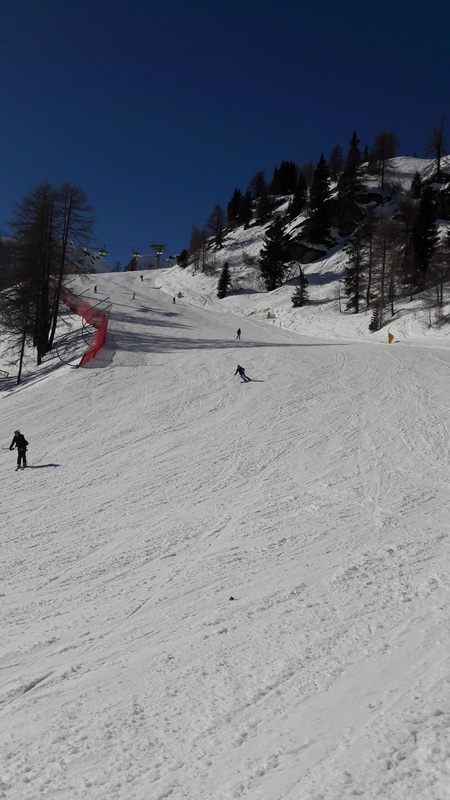 But for skiing, the actual sport is rather brief (and some believe in making it quicker still), but the efforts to get to that part is very, very long. So if we can eliminate one part of it and actually walk (or in my case, waddle) to the ski lifts then it was a welcome offer. So each morning after breakfast, my family and I would change into our ski clothes and stride (or acutely resemble a penguin walk) over to one of the several ski runs. After the aforementioned moment of panic, I would arrive at the top of the slope. And the breathtaking beauty of the snow covered mountains would hit me at the same instant as the human ingenuity that allowed for us to device cunning little slats to negotiate its steep pistes. 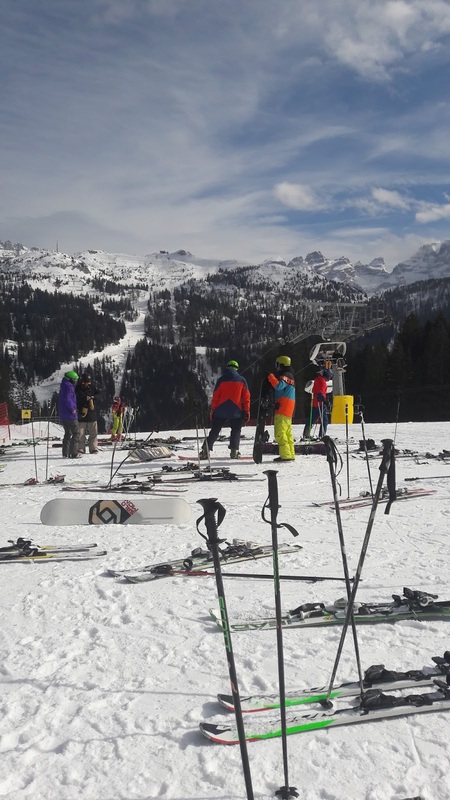 The ski runs around Madonna di Campiglio are varied and suited to various skiing skills. 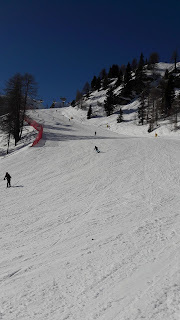 I ended up on a red run on the first day by mistake but attempted one by choice the next day and by the third day, I was rather looking forward to the challenge of skiing down a red piste. 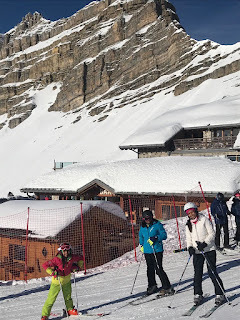 We would ski all morning, pause for a leisurely lunch which included fantastic vegetarian offerings (we were in Italy after all) and ski for a few more hours before making our way back to the hotel around four in the afternoon. At the hotel, a soak in the jacuzzi or a massage would be availed of followed by a sumptuous four course dinner. 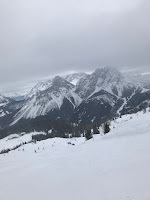 It is perhaps the first time that I have truly enjoyed being out skiing. 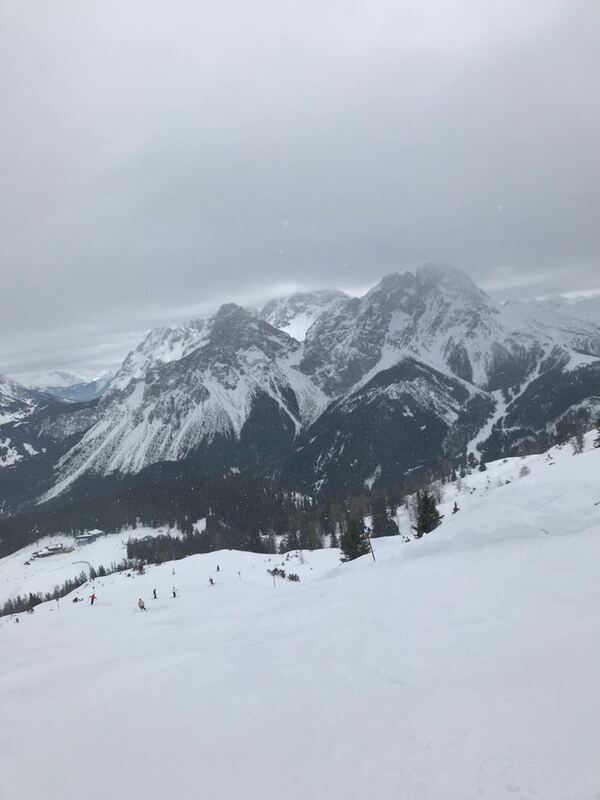 It also reminded me that as much as skiing is about going downhill, it is also a reminder to look up, marvel at the mountains, being humbled by them before surrendering to their inevitable pull. 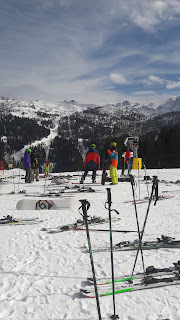 We stayed at the Savoia Palace in Madonna di Campiglio on a half-board basis. This is not a paid post.